Shoulder pain after a vaccine injection is common, and almost always pain that does occur resolves within a day or two. Many patients describe symptoms of a dull ache in the muscle on the outside of the shoulder (the deltoid muscle) that is a result of having the injection placed directly into the muscle tissue. When this aching sensation occurs, typically an ice pack, some anti-inflammatory medications, and a few days of rest will allow the symptoms to subside. But what if the painful symptoms persist? Could something more be wrong? Well, it turns out that sometimes shoulder pain can become a chronic problem after a vaccination. There is even a name for the condition: shoulder injury related to vaccine administration, or SIRVA. In these patients, the shoulder pain can be long-lasting and debilitating. Patients diagnosed with SIRVA may find relief with treatments targeted at controlling the inflammation such as oral medications and cortisone injections. Rarely is surgery necessary for the treatment of this condition, although the effective treatment of SIRVA can take months for resolution. This is a subject of great interest and debate among many people. It is very clear that the benefits of vaccinations far outweigh the risks of having the injections. Unfortunately, because of the debate taking place, some people are worried about acknowledging any problems with vaccines. However, SIRVA is not a result of a problem with the ingredients of the vaccination, but rather a problem with the placement of the needle that delivers the vaccine to the incorrect location. It is important that while caregivers and patients should be aware of this possible complication, this should not be a reason to avoid vaccinations. Rather it should be a caution that even with seemingly simple medical procedures, care should be taken to ensure they are performed appropriately. While it is clear that incorrect administration of a vaccine into the shoulder joint or the shoulder bursa can cause a severe inflammatory response and chronic shoulder pain, it is also clear that vaccines are effective at preventing life-threatening diseases. Furthermore, careful administration of vaccines can help to ensure that SIRVA will not be a problem for you. Make sure anyone giving any injection (vaccine or otherwise) is trained in the proper administration of shoulder injections. Take your shirt off, or wear a shirt that you can pull up over your shoulder (don't pull your shirt down, exposing only the top of your shoulder). Placement of the needle too high in the arm can lead to inadvertent placement into the shoulder joint. If you have pain that persists beyond a few days, be sure to let your doctor know. There are effective treatments for SIRVA. SIRVA is an unusual, rare complication related to the location of vaccine administration, not a problem with the actual vaccine. As with any medical procedure, even seemingly innocuous interventions, there are possible complications that can occur. If you have any concerns about vaccine administration, you should discuss these with your healthcare provider. 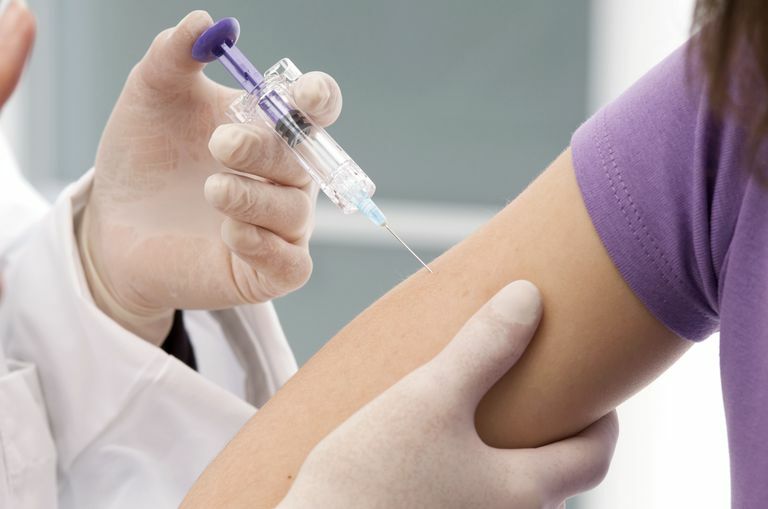 Vaccines administered to the shoulder area are exceedingly safe, and there is no question that research demonstrates that the benefits from the flu vaccine, and other immunizations, far outweigh the risks of these injections. However, there are problems that can occur, including chronic shoulder pain resulting from incorrectly administered injections. Making sure your medical practitioner is trained in proper vaccine administration can help to ensure this complication will not happen to you. Atanasoff S, Ryan T, Lightfoot R, Johann-Liang R. "Shoulder injury related to vaccine administration (SIRVA) 404" Vaccine. 2010 Nov 29;28(51):8049-52. Zhang S. "Why are cases of shoulder injuries from vaccines increasing?" Wired. 9/3/15. What Are Three Potential Reasons for Shoulder Pain? Why Does It Hurt My Shoulder To Throw A Ball? The Painful Arc in Your Shoulder-What Does it Mean?